Alongside the busy traffic on Weston Road, a ceremony was held by the Weston Historical Society (WHS) Saturday to dedicate a plaque commemorating the European discovery of the Carrying Place Trail. 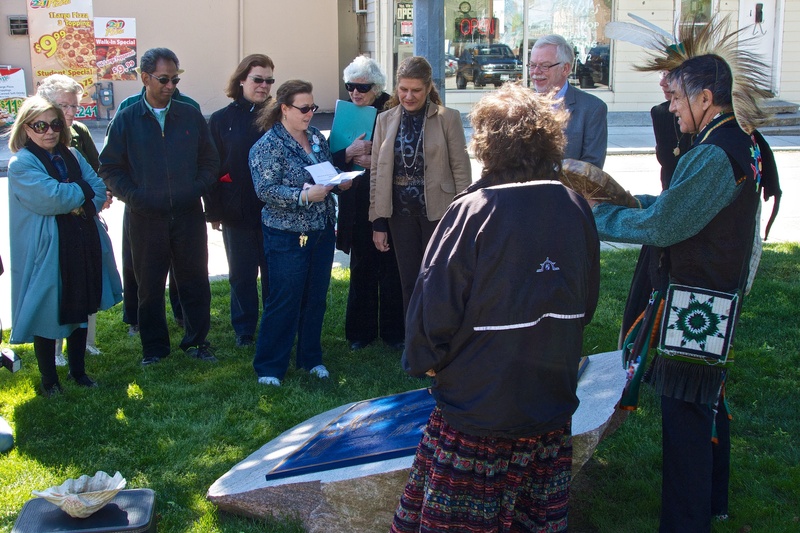 The plaque, a brainchild of WHS, was partly funded by a grant of $1000 from Metrolinx. The trail was a route that followed the eastern banks of the Humber River used by Aboriginal people between Toronto and Lake Simcoe. 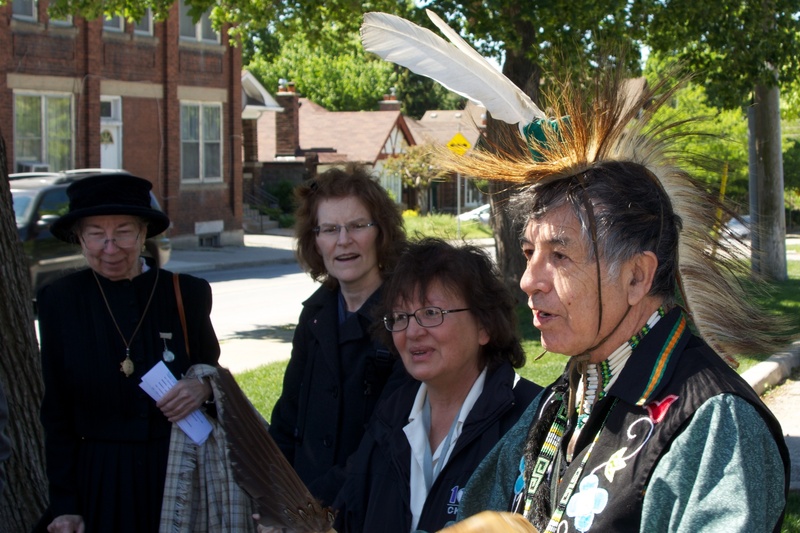 The plaque, on the corner of Weston Road and Little Avenue is right on the original trail and commemorates Weston’s place on the trail as well as the countless generations of Aboriginal people who lived here before being displaced by European settlement. Elder Garry Sault of the Mississaugas of the New Credit First Nations along with Carolyn King, co-chair of the New Credit First Nations Cultural Committee led a traditional Aboriginal blessing with smudging and drumming and later spoke about the history of the natives who lived in the area. 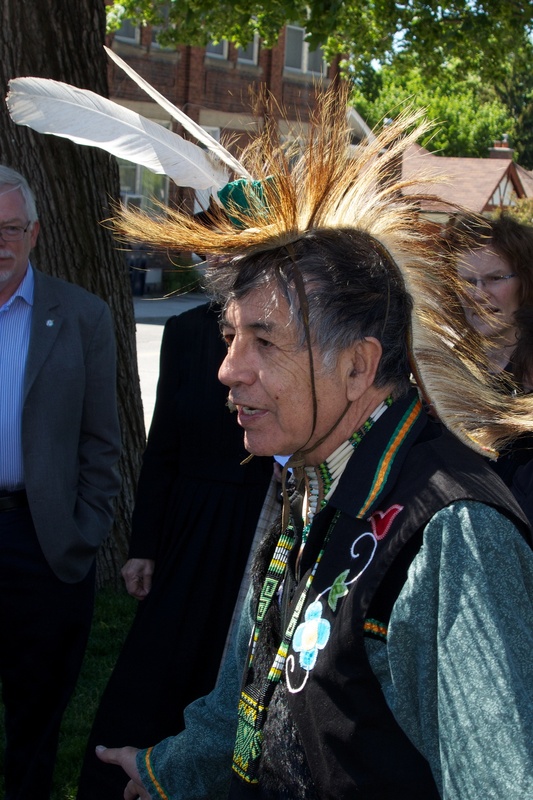 Elder Garry Sault of the Mississaugas of the New Credit First Nations. Mary Louise Ashborne spoke of the vast amounts of wildlife that populated the area until made extinct (e.g. passenger pigeon) or decimated by hunting or pollution (e.g. Atlantic salmon). Several Weston VIPs were in attendance – almost outnumbering the public who chose to attend. L to R, facing camera, Councillor Frances Nunziata, BIA Chair Masum Hossain, Suri Weinberg-Linsky, Weston Historical Society President, Mary Louise Ashborne, MPP Laura Albanese, MP Mike Sullivan. L to R, Humber River Guardian Madeleine McDowell, Cherri Hurst (WHS), Carolyn King, Elder Garry Sault. Mike Sullivan spoke about his private-members bill to restore protection to the Humber, designated a Heritage River in 1999. He is concerned that oil pipelines that cross the Humber may more easily spill their contents into the river thanks to recent federal legislation that loosened environmental protection for the river. The unveiling was followed by a Jane’s Walk hosted by the WHS, south along the Humber pointing out places of historical interest along the way.